In London I took a social psychology course. one of the best classes of my life. 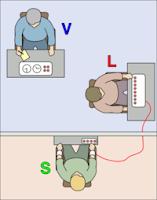 And, one of the most outstanding things I learned was about an experiment called "The milgram experiment"... the experiment revolves around obedience and group behavior when told to do something by someone who is considered "a professional" or of "authority" the results are very interesting and scary. Granted this study was done a while back but worth reading about anyway especially in the world today.